A classic, yet original Osprey publication on a familiar but important subject, with large spread 3D and 2D maps, decent quality photographic images though startlingly, a few that are rather low in resolution, full colour artwork by medieval master Graham Turner and commentary to go along with them all. Additionally, it should be noted that Osprey now adds as standard, Index and Further reading sections, as well as the familiar chronology and ORBAT etc, in all their books. Usually battles are remembered best because of the commanders who directed them, Campaldino is famous because the then unknown Dante Alighieri fought in it with the Florentine Militia Cavalry. This book is subtitled, the battle that made Dante, and argues for the importance of the battle in the poet’s legendary ‘divine comedy’. For Dante’s version of hell might well in reality be based on the the infernal scenes he saw in June of 1289. 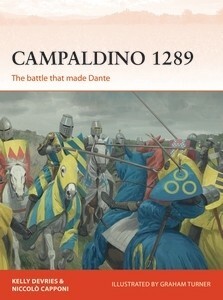 If indeed the battle did inform much of the comedy, and the authors give persuasive argument that it did, then Campaldino rightfully deserves a place amongst the great clashes of history, for the work it inspired is widely considered one of masterpieces of western literature. Having survived the ghastly press, it isn’t so hard to believe that Dante’s mind might later have wandered to the thousands of lifeless corpses he had seen, and to where all the souls that used to inhabit them went. Therefore if Campaldino has any right to immortality it is because of its effect on literature. But from a military and political perspective it is no less significant. Heralding as it did the rise of Florence and the cause of the Pope against the Holy Roman Empire. A deeply significant moment then for Italy, the states of which would find themselves facing much the same political enemy as late as 1800. As a battle it is a remarkable piece of medieval brutality, gloved in the velvet of chivalry. Few other battles can have been started by the charge of a mere 12 men after all. While the dynamics of the action are interesting, as with most medieval fights the tactics are fairly straightforward. Nevertheless the organisation and operations of the armies are fascinating. Also of note is how different Italy was from the rest of Europe when it came to war. Democracy and feudalism walked hand in hand, from the election of leaders to the vote on battle plans. To the unusual troop types and the various convoluted war aims and rivalries, which are more familiar to general medieval warfare. The author’s are clearly at home with their subject, which is an excellent study for the campaign series and its great to see these medieval Italian battles being written about and placed in their rightful place amongst the great clashes of history. What is especially exciting about it is that the Military history of Italy doesn’t exist in an accessible way beyond the fall of Rome. It’s either in Italian or no one writing in English wants to write about it. Medieval Italian warfare is specifically obscure and exists, in English, only because some people like the idea of the Condottieri. If Osprey are going to produce more titles on the Guelph and Ghibelline Wars, or the Sicilian Vespers, dare we hope for the Wars of the Giudicatti? Then this is an excellent start. For the most part however, the argument is that battle’s significance is once more in the aid of western civilisation than any short term politics. 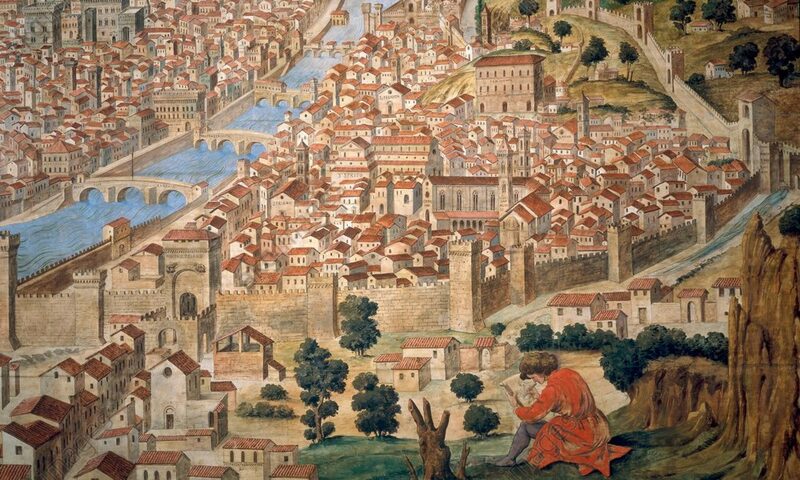 One might even go so far as to agree, after reading this book, that as went Campaldino, so went Florence, so Dante and Dade we say it, so went the renaissance? 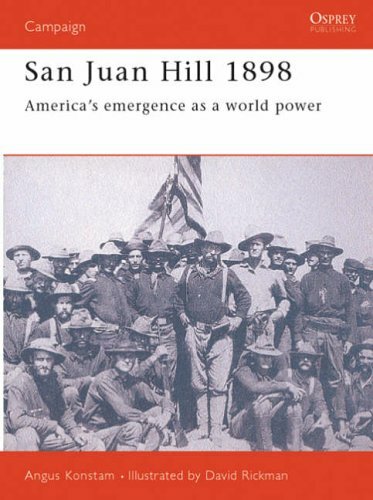 Book Review: San Juan 1898 by Angus Konstam. Osprey books are some of the most invaluable references for military history available and I have always considered their campaign books to be some of their finest products. These slim little numbers offer concise yet detailed accounts of military actions, both large and small, famous and obscure from Ancient Egypt to the present day, and should be the first port of call for people wanting to get to know the nuts and bolts of any conflict. All Osprey books have a similar appearance, but this appearance has changed over time, I picked up a 1997 edition of San Juan 1898 second hand. Back then the Campaign books were more individualistic and mostly black. Nowadays they still have the broad frontispiece picture on the front but the differing series’ are identified by colour bands, orange for campaign and so on. The author is Angus Konstam, one of the veteran Osprey writers and one of the finest in the pool. This is reflected in the lucid text, full of detail and verve, generously salted by first hand snippets. As anyone with basic knowledge will know, the San Juan Hill is more than the name suggests, and all the ancillary actions that made up the battle are included, as well as the skirmish at Las Gossimas and the Naval battle of Santiago, but the battle at Fort McCalla is only briefly mentioned. The Rough Riders feature prominently along with the 9th and 10th Cavalry and 71st US Infantry. The Spanish side, and the Cubans, also get a word in, not as big a word as the US, but that is to be expected. He makes a slight misjudgement when asserting the Spanish had not fought a regular army since the Napoleonic Wars, but on the whole slip ups like that are not to be found. Osprey books are heavily illustrated, catering to the little kid still playing toy soldiers inside most of us, we like to see the pictures. Amongst the text and on 99.99 percent of all pages are scattered many images that accentuate the flow of the descriptions and help carry it along. This one has some very fine images, one of my favourites, besides the classic image of Teddy Roosevelt and his men on top of San Juan Hill, is the image of the 1st Marine Battalion raising the Stars and Stripes over Fort McCall at Guantanamo Bay just after landing, a pre Iwo Jima moment if you will. The best part about Osprey books, and the Campaign series in general, is the large specially commissioned two page art and high detailed 3D maps that form the centrepieces of the books. The 2D and 3D maps contradict each other once, but as usual are very well done, if old fashioned, in this book. David Rickman illustrated this one with a colourful and energetic series of eye catching paintings that show the old Osprey habit of packing books full of commissioned images, the best are the Advance up the Camino Reale and the Defence of El Caney. They are not exceptional, not the level you get with Graham Turner, the late Angus McBride or Steeve Noon for example but their quantity is very refreshing. This is a very good overview of the campaign and it has all that I require in an Osprey book, detailing how the campaign that set America on course to become a world power unfolded. Book Review. The Scandal of George III’s Court. By Catherine Curzon. Book Review: The Pharaoh’s Treasure by John Gaudet. Book Review: Beyond the Northlands by Eleanor Rosamond Barraclough.